The Big South Conference is now confirmed as the future home for Kennesaw State football beginning in 2015. The Owls join the conference as a football only associate member and continue to compete in the Atlantic Sun Conference for the other 17 NCAA Division I sports. But, there are questions regarding the football side of the Big South Conference. With recent departures of cornerstone teams, like Stoney Brook and Virginia Military Institute, how will the conference survive? What teams will join the Big South and what teams will seek greener pastures? Most importantly, where does Kennesaw State fit into this ever-changing world of college football conferences? The Big South Conference has 12 members that include Campbell, Charleston Southern, Coastal Carolina, Gardner Webb, High Point, Liberty, Longwood, Presbyterian, Radford, UNC-Asheville, Virginia Military Institute (VMI), and Winthrop. Of those teams, only seven have football as a varsity sport, (Campbell, Charleston Southern, Gardner Webb, Liberty, Presbyterian, and VMI). Campbell’s football does not compete in the Big South Conference. The Fighting Camels are a non-scholarship program that plays in the Pioneer League, but have considered making football a scholarship sport. That leaves six schools competing in football. However, this is the last season for VMI, as they will move to the Southern Conference in 2014. Liberty is likely to make a move from the Football Champion Series (FCS) to the Football Bowl Series (FBS) before 2015. So that leaves five lonely schools to compete for an 2013 automatic bid into the FCS playoffs with Monmouth joining in 2014. But, the potential for the Big South is significant with several schools looking for new conferences, upgrading divisions, and adding football. As Kennesaw State joins the Big South Conference, they will be the only team from Georgia in the conference. But there is potential for expansion. The University of West Georgia formed a commission in the summer of 2012 to explore moving athletics to the Division I level, according to the AJC. The addition of West Georgia would create an instant footprint in Georgia for the Big South and create a rivalry with Kennesaw State that previously didn’t exist. The Wolves announced on August 6, 2013 that their current Athletic Director and Head Football Coach Daryl Dickey will exclusively be focused on the job of Athletic Director. That move clears the way for a new football coach and the focus on moving West Georgia’s athletics forward. Another Georgia college that would make sense for a move to the Big South is Valdosta State. The Blazers have won back-to-back D-II national championships and brought attention back to Winnersville, USA. The big hurdle for Valdosta State is their facilities. They still are sharing a stadium with the legendary Valdosta High School. Brazemore-Hyder Stadium belongs to the city of Valdosta. The stadium was opened in 1922 and currently seats just under 12, 000 fans. The stadium recently added field turf and painted the Valdosta High School logo at mid-field. That made Valdosta State fans and players question the need for their own stadium. But stadiums cost money and Valdosta State has not moved on seeking to build their own stadium as of yet. However, they have looked into purchasing Brazemore-Hyder Stadium from the city, but that is just chatter. 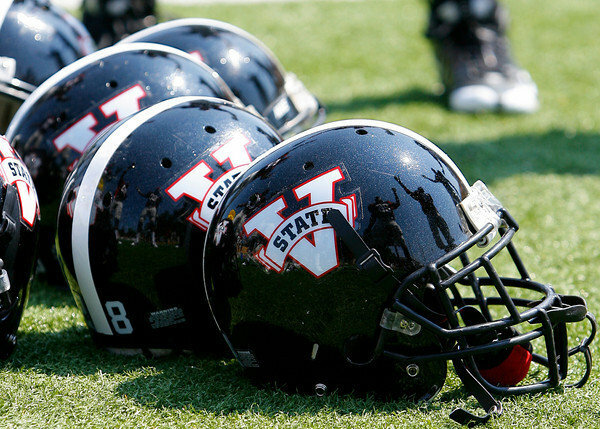 The pressure maybe put on Valdosta State to upgrade to D-I if their in-state rival West Georgia makes to move. Outside of Georgia potential members for the Big South include a school from the Alabama, The University of North Alabama. They currently are Division II and compete in the Gulf South Conference with West Georgia and Valdosta State. The athletic department has been very outspoken about exploring the move into Division I. The Lions will have several options when they move. The Big South is one and the Ohio Valley Conference (OVC) is another. Rumor has it that North Alabama has already been in contact with the OVC about making a move. But, if the Big South can get West Georgia and Valdosta State to commit to its conference, North Alabama just might follow. There has been a long history and rivalry between North Alabama and Valdosta State. It would be a shame to lose it if both schools move into D-I. The Gulf South Conference of NCAA Division II isn’t the only conference the Big South may pillage. 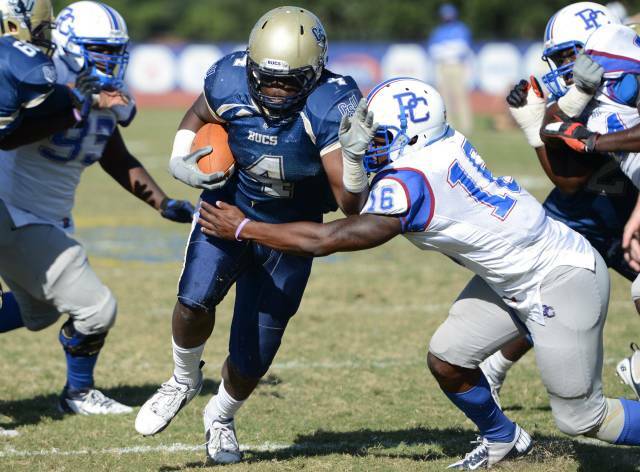 The Mid-Eastern Atlantic Conference (MEAC) may also be a target. There are tons of chatter about the Delaware State Hornets making the move into the Big South. The Hornets were one of the first teams to be considered a candidate for the Big South once VMI bolted to the Southern Conference. Delaware State is a member of the Historically Black Colleges and Universities and would be only the second HBCU that played outside of one of its conferences. The other one being Tennessee Tech. That probably wouldn’t deter Delaware State, but it might encourage other HBCU schools to take flight. Hampton University in Hampton, Virginia has also been rumored to be seeking a Division I conference such as the OVC or Big South. A move by Delaware State may open new doors for the Big South to attract schools from the HBCU. Some existing schools that are outside of the Big South, but are currently playing football might be another option. Jacksonville University is a prime candidate. They currently play in the Pioneer League with Campbell. Although there isn’t much internet hoopla about them advancing to the scholarship level, Jacksonville has had a successful program in the stepping stone that is the Pioneer Football League. The program there is ready to make the move and the Big South would be a very easy move for the Dolphins. It would also bring Florida into the Big South’s presence. One final opportunity for the Big South is completely out of their hands. Current Big South member Winthrop University has hinted that they may begin playing football. Similarly to Kennesaw State, the community and students are clamoring for it, but the university still is saying, “not yet.” The Eagles have a soccer complex that would be suitable for a start-up football team, but of course, everyone wants their own stadium, so that would have to be a consideration. Watch the Winthrop situation closely, because it could change very rapidly. Currently with six teams in the Big South competing in football the conference prestige has dwindled. Big South Commissioner Kyle Kallander has stood firm on the idea that the Big South is still strong. Believe it, he is reaching out to solidify his conference in new ways. No one is off-limits and if he can pull off the aforementioned candidates, the Big South will be relevant once again.